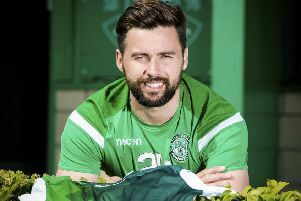 The “Petrie Out” campaign expects to hear today whether Hibernian owner Sir Tom Farmer will accept their calls for a meeting to press for greater fan involvement in the club after they contacted the tycoon yesterday. However, there was no update from Easter Road last night on the future of manager Terry Butcher, who is due to hold talks this week with the club’s new chief executive Leeann Dempster. Butcher, who presided over the club’s relegation to the Championship, is determined to lead their bid to win promotion, but there have been no guarantees yet from Dempster that he will be allowed to stay. The backlash against chairman Rod Petrie continues at pace. Former fans’ favourite Paul Kane was joined by club legend Pat Stanton, ex-players Jackie McNamara snr and Mickey Weir, and prominent supporter Kenny McLean jr, son of the former vice-chairman and Hands off Hibs head of the same name, at Easter Road on Saturday as a 1,500-strong rally cranked up the pressure on Petrie. Petrie has been blamed by supporters for the on-field malaise that has engulfed the club in recent times, leading to the embarrassment of relegation following their play-off defeat by Hamilton Accies last month. Campaigners are keen to take their message directly to Sir Tom, whose backing for Petrie has never wavered since the millionaire installed the chartered accountant on the club’s board 18 years ago. However, with Dempster having branded the movement’s “Petrie Out” message as too simplistic, Kane is also eager to take the struggle on to what he has described as “phase two” and urge greater fan involvement in the club. At the weekend, the 48-year-old alluded to former Motherwell owner John Boyle gifting his shareholding in the Fir Park outfit to an independent trust as a possible route for Farmer. Kane made contact with Farmer’s office yesterday and has been told to expect a response today. Kane explained: “Following the success of the rally at Easter Road on Saturday, I contacted Sir Tom Farmer’s office requesting a meeting. The fans have made clear their feelings regarding the chairman, Rod Petrie, and how his time is up.